Cut pieces of spruce tree + Calcium bisulphite cooked in steam under pressure – 14hrs. 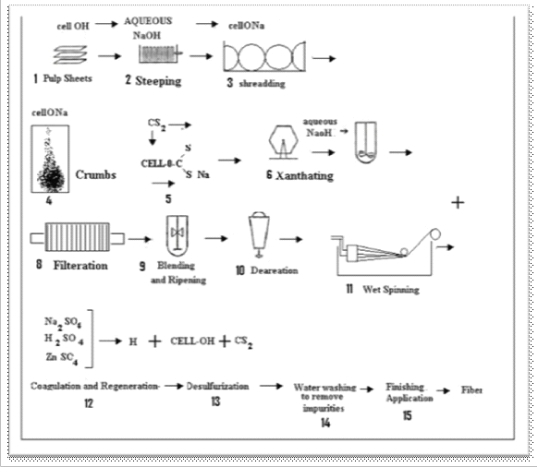 Lignin (Cementing materials) converted + bleaching agent (Sodium Hypochlorite) converts pulp sheets. Size 60×80 cm w.t – 400-450 grams. Conditioned pulp sheets + NaOH Soln (17.5%) add in the tank. Sheets become dark brown color 1-4 hrs at 17C, Cellulose converted into Soda Cellulose and hemicelluloses. Soda cellulose fed to shredding machine. Pulp sheets are cut into small bits.In 2-3 hrs and 25.30°C sheets are broken into fine pieces called crumbs(Temp controlled). Crumbs are stored in steel drums – 72hrs. at 22°C.Degree of Polymerization of soda cellulose decreases from 1000 to 300. Crumbs are transferred to rotating drum + 10% CS₂ is added (Speed 2 rpm – 3hrs) Sodium cellulose Xanthate is formed. Color changes from white to light yellow, to deep yellow and reddish orange. Sodium Cellulose Xanthate added in mixer + NaOH (4-6%) added and stirred for 4 – 5 hrs.It dissolves and give clear brown, thick viscose liquor called “Viscose”. Viscose solution is blended in a big mixer and solutions are pumped. Blending is done for any irregulations present in different batches of viscose soln to get uniform quality of the final product.Soln is filtered and remove undissolved dirt. Removals of air from solutions are carried (deareation) by vacuum applied (In a tight vessel). Viscose solution stored 2-5 days at 10-18°C viscosity decreases (Measure thickness solution)(for best Spg qualities). Ripened solutions are filtered and are ready for spinning. Water 69% —- Viscose Solutions forced through the spinnerets having fine holes (0.05 mm dia).Viscose filaments emerging from the spinneret and cellulose is regenerated. article? I’d really love to be a part of community where I can get cоmments from otheг experienced individuals that share the same interest.